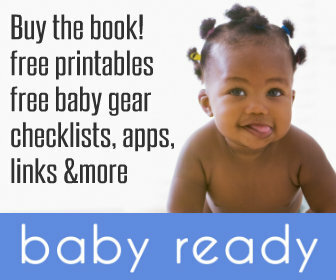 I'm excited to share with you the release of "Baby Ready - Preparing for and Adapting to Life with Baby," written by my blogging friend Monica Pruett of HappyandBlessedHome.com. An ideal book for any expectant mom, both experienced and first-timers, this would also make a great shower gift (hint, hint!). Monica walks you through what to look for in selecting a doctor and a hospital. Have you considered a doula or midwife? She explains the differences and suggests questions to ask when looking for one. And what do you pack in a bag to take to the hospital? A first time mom might have no idea - consider this a handy checklist! She's got you covered for when you get home from the hospital with your new little one, too, from meals to feeding to diaper bag necessities. I was continuously amazed at how she seemed to think of everything! This is going to be a go-to guide whether you're expecting your first baby or you're already a veteran mommy. Reading it is like getting advice from a friend who knows just what you're looking to find out and is always ready with words of encouragement. The message is, "You can do this." "I know what its like to be a mom who feels like she is on over her head and doesnât know where to turn for help. Thatâs why I wrote this book, to give tips on where to look for help. I think as moms we take on a tremendous responsibility with our infant children. I encourage you to seek help and build relationships with people you trust so you donât embark on mommy-hood alone." I read a ton of books and Googled everything on what I would need or do after having a baby. I wish I had know about this before I had my daughter. I'll pass the link on to any friends who get pregnant with their first. Helpful books are great at easing anxieties that first time.